Knit Stories #1 : First Batch! - Life's Never Boring Beibi! Finally! I've just finished my first knitting project. Huwooooow. The first step is always the hardest, isn't it? I actually thought the second step is the hardest, tho. Anyway, I got introduced to knitting by the event #JogjaEklektik when I learnt yubiami, finger-knitting. Mbak Ajeng, the owner of Poyeng, a lovely little workshop in Jogja where you could learn almost everything about knitting, was the one who gave the lesson of yubiami. Later, I came to Poyeng for lend a tapestry needle, because I want to sew my yubiami results. I was in awe with the variants of the yarns, needles and another knitting tidbits. I dare myself with buying a set of double points bamboo needles and a roll of soft acrylic yarns, by the Poyeng fellow assistance. 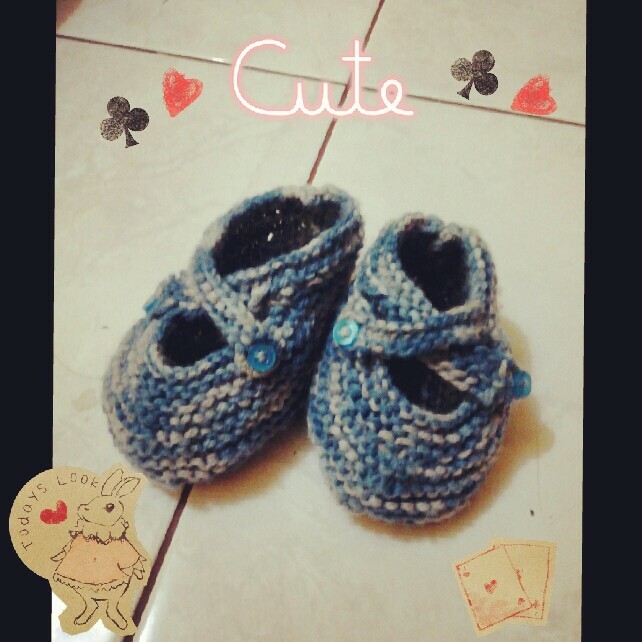 She said that I could try to learn make a pair of baby shoes for the first challenge. I visited mbak Ajeng's blog, then get the pattern here. And now, I proudly present my first booties. Yeay!